The Ricoh Aficio SP1000SF offers excellent flexibility for its class with time-saving functions normally found on higher-volume devices. 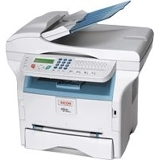 Discover a perfect addition for any fast-paced small office or workgroup the RICOH Aficio SP 1000SF. This multifunctional black & white laser system delivers the capabilities you need to maintain high productivity, an intuitive design that simplifies common tasks and the exceptional reliability you have come to expect from Ricoh products.